Postal Domiciliation and Office Spot rental. 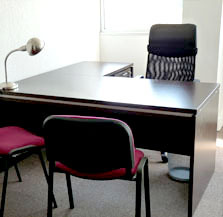 Rental offices and Meeting/ Training Rooms with all the facilities. Printing Services, Gaphic Design and Street Marketing. To give efficiency to your projects. Some concrete solutions to optimize your resources. We wil help you to reduce and control your fix costs. Because of its various experience in different fields the Business Center "l’Espace Entreprise" of Montpellier is offering you a wide range of services and solutions to help you to find the best response to your needs in terms of Company Hosting, Consulting, Management and Comunication.
" l’Espace Entreprise" of Montpellier has developped four departments of competence.